“Mom it tastes like Christmas”, said my 15-year-old taking his first bite of the millet cake. My experiments with millet recipes haven’t always been received with the same enthusiasm. Happily and hopefully, all that is about to change with this cake. I’m inclined more and more to bake with gluten-free flours, always seeking recipes where millet, nut and other healthier flours can replace regular flour. Many a millet recipe has gotten me excited, often ending in mediocre to disastrous results, but this one I can definitely put on my encore list. In India, millets like foxtail (kanganee), finger millet (ragi or naachni), pearl millet (bajra), barnyard millet (sama ka chawal), sorghum (jowar) and many others were traditionally consumed as porridge, unleavened, rustic rotis, or simply cooked down to a thick polenta-like consistency and eaten with a vegetable-based curry. As hardy plants that could survive vagaries of the weather and water shortage, millets have sustained generations especially in labour-intensive farming communities. That probably explains why they were perceived as being the poor man’s food. As with all developing societies, with progress, we moved away from these humble staples to a more ‘civilised diet’ of wheat and rice. But we’ve come full circle now. The modern way of life saw an alarming rise in lifestyle diseases like diabetes, hypertension and heart ailments. So now, we are looking for healthier sources of nutrition. In the process we are rediscovering our food heritage and millets are slowly but surely making a comeback with nutritionists and cooks trying new millet recipes. Finger millet or ragi resembles the mustard seed and is sold in grain and flour form. It is eaten extensively in parts of southern and western India and is even used as a weaning food for babies. My cake-loving teenager was weaned with copious amounts of finger-millet porridge and processed baby food wasn’t missed one bit. It is a low G I food that great for building bone health, has anti-aging properties, is dense in calcium and iron, helps metabolism being fibre-rich and is known to help with depression and insomnia. So yes, it is very very good for you. You should eat this cake for all this and not in the least because this millet recipe makes a moist, delicious cake. I ate a big slice everyday for a week for breakfast and now that it has gone, I can’t wait to bake the next one. Plus, it just feels so good to eat cake for breakfast a la Marie of the ”Let them eat cake”, fame. Healthy decadence is a delicious oxymoron. I adapted the recipe from Food52 by making it gluten-free and tweaking the quantities and a few ingredients. This millet recipe is as much about the millet as it is about dates. Fat, soft and sweet, the dates render the texture to that of wet earth. Imagine sinking your fingers into freshly rained-on dark soil, heavy with moisture and heady fragrance. Cinnamon resonates through the cake and shards of walnuts speckle its dense landscape. It is a gluten-free finger millet cake so it needed a binder, something to hold it all together. 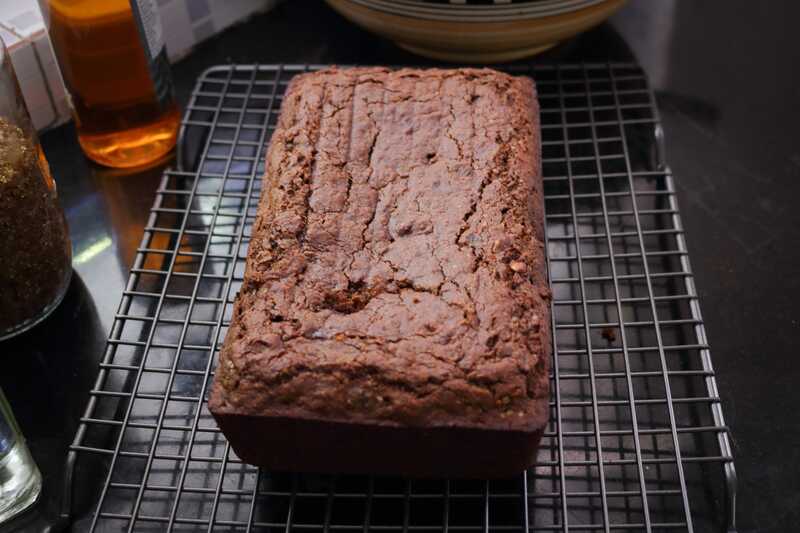 Oatmeal and powdered flax seeds are plenty sticky to be the cement that gives structure to the cake. And since we are doing healthy, both ingredients only enhance the nutrition quotient. The dates soaked in hot water, flax and coconut oil in this millet recipe make for a wet batter that need to be baked gently for a little longer than you would a regular cake. Don’t crank up the heat to rush the cake because this will only burn the outside leaving the core looking like undercooked gloop. It should feel like well-watered, moist soil rather than water-logged slush. Be patient, read a book, sip a glass or two of wine and let the cake come along at its own pace. Other than that, this is a straightforward recipe that you can depend on to deliver, every time you’re in the mood for cake at breakfast. A health cake bursting with the goodness of finger millet, oats,dates and walnuts. Preheat the oven to 176℃ and lightly spray a 9 x 5 inch loaf pan with cooking spray. Soak the chopped dates in the boiling water while you mix the other ingredients. Whisk together the flours, salt, cinnamon powder and sugar in a bowl. 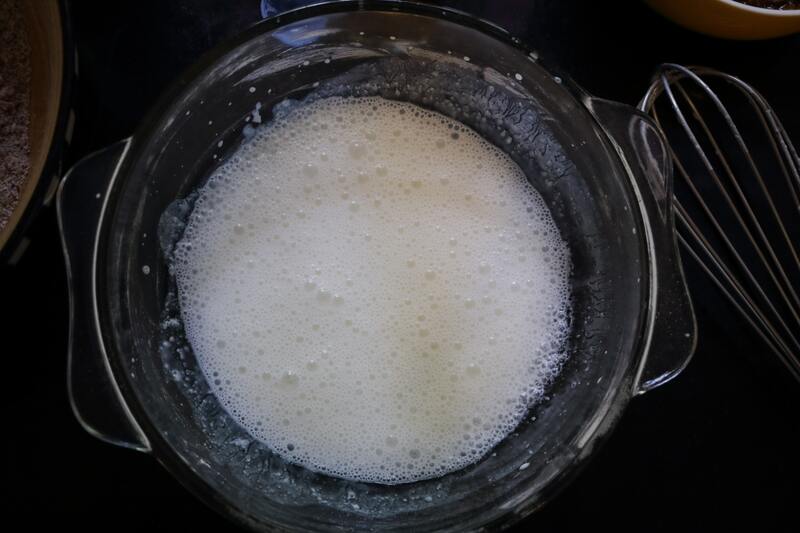 In another bowl vigorously whisk the milk and vinegar till it’s frothy and topped with bubbles. Now add the coconut oil and flaxseed mixture and combine. Gently fold the wet mixture into the dry ingredients taking care not to overmix. 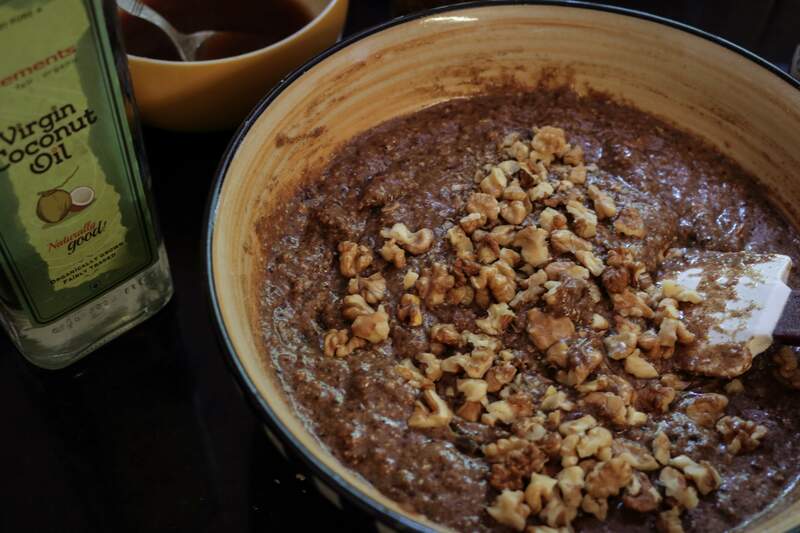 Drain the dates and mix into the batter along with the walnuts. Pour the batter into the loaf pan and bake 55-60 minutes till you get a clean toothpick. Cover the top with foil if you feel it is browning too quickly. Gently, turn out the cake on a wire rack and cool completely before slicing. I’m not sure whether this recipe will work in the cooker. I think pressure cooker cakes have specific recipes. Awesome recipe. I followed it almost exactly, and it gave me 12 cupcakes. The things that I changed: I skipped milk and sugar in my recipe as I wanted it to be lactose free and I like it less sweet. I kept the date water (which was supposed to be removed according to the recipe). I didn’t have walnuts, but I am sure that would add to the recipe. Instead of coconut oil (which again I did not have), I added 3 tbsp of ghee. Everything else is exactly as suggested in the recipe. And it tasted awesome!! Thank you. You’r most welcome Deepti. And it’s great that you could make your substitutions work. Truly appreciate the feedback. Hi can we substitute flax seeds with applesauce if yes pls mention quantity . I choose to use metric measurements because cup measurements in different countries hold different amounts and it’s easy to go wrong. But if you prefer using cup measurements, try the weight conversion chart on the King Arthur Flour website. https://www.kingarthurflour.com/learn/ingredient-weight-chart.html Hope you find it helpful. I use it for all my conversion calculations. 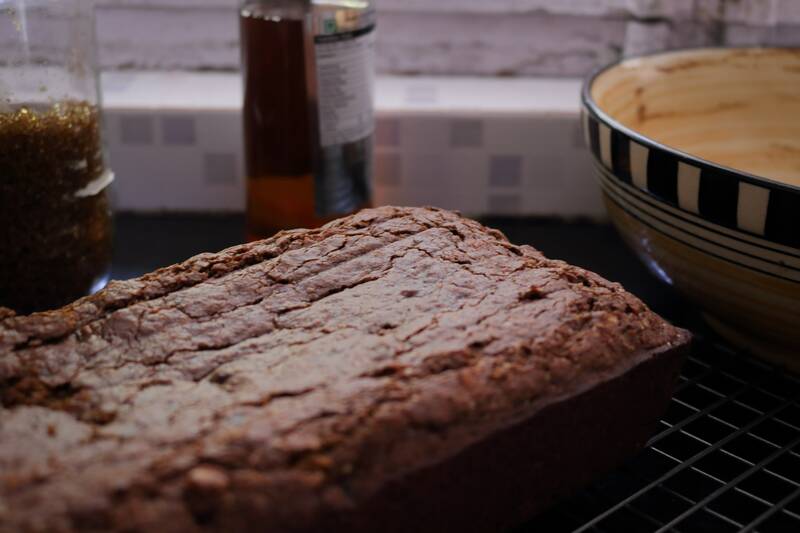 The flax seeds help to bind the cake in the absence of eggs. Not sure applesauce will do the same. Tried it out first time and has come out absolutely perfect. Thank you. So happy to hear that it turned out good :-D.
I would think 5-6 days in a dry and cool climate. I put it in the fridge after the first day since I live in hot and humid weather. It’ll keep for 5-6 days in cool, dry weather. It’s hot and humid where I live so I prefer to keep it in the fridge after the first day or two. I live in the US where there only seems to be one kind of millet readily available. Are the various varieties of millet interchangeable? I’m Supriya :-D. To be honest I haven’t tried this cake with any other millet but I think you can safely experiment with the millet you have at hand. The key I think is the amount of moisture that millets need; some needing more than others. My suggestion is to follow your instinct and increase/decrease the liquid as you require. I’m fairly certain that the result will not be a disaster. let me know how your fare.